A versatile model with built-in dual illumination for a wide range of scientific and industrial applications. ♦ Gives a clear large sharp, flat and erect image. 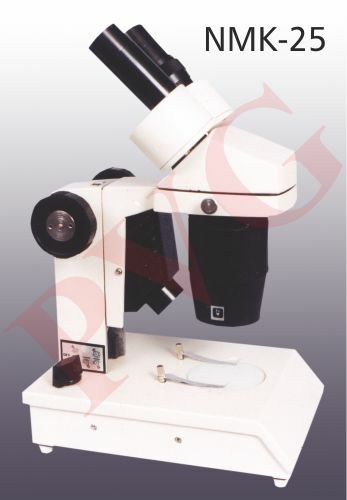 ♦ A fully rotatable head with binocular tubes inclined at 45º for easy viewing. ♦ With locked in 10 x widefield eyepieces. ♦ Independent focus on left eye tube. ♦ Adjustable interpupillary distance from 51 to 74 mm. ♦ Long working distance of 90 mm with 2 x and 45 mm with 4x & large field of view. ♦ Dual magnification of 20 x and 40 x. 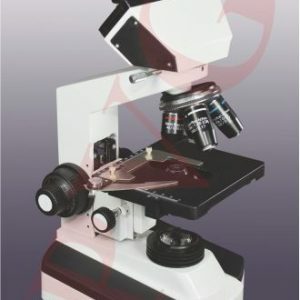 ♦ Convenient 90º rotating turret magnification changer with parfocal paired objectives 2 x and 4 x. ♦ Smooth rack and pinion focussing by easily tightened knobs with safety clutch mechanism and preset safety stop to avoid any damage to the specimen or slide. ♦ Glass stage with black & white matted plate and locked in stage clips. ♦ Built in variable intensity dual illumination provides both incident and transmitted light independently or simultaneously. ♦ Sturdy, casted stable base with built in transformer for light control by 6 V-15 W lamp, input 220 V 50 Hz AC. For education and routine research work through unrivalled performance. 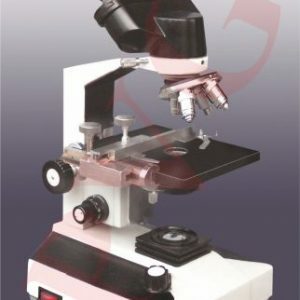 Good quality material is used for trouble free life of these Microscopes. ◘ Binocular head rotatable 360º, inclined 45º for maximum viewing comfort and can be locked with a thumb screw at any position. ◘ Large casted stable base with upright body. ◘ Eyepiece paired 10 x widefield. ◘ Quadruple revolving nose piece with positive click stop. ◘ Objectives achromatic 4 x, 10 x, 40 x spring loaded and 100 x spring loaded oil immersion. ◘ Fixed square stage 120 x 120 mm, fitted with precision mechanical stage for X and Y movement of slide 75 mm x 50 mm. Having fine graduated scale and vernier. ◘ With movable substage condenser N.A. 1.3 with iris diaphragm and filter holder. ◘ Separate coarse & fine slow motion with deep cut rack and pinion, graduated fine focussing knob. ◘ Preset travel stop protects objective and slide. ◘ With built-in-base illumination system 6 V, 20 W halogen light source through solid state transformer, On/Off switch and light intensity regulator. ◘ Complete with moulded power cord and plug to use on 220 V,50 Hz A.C.
normally found in expensive models. Designed for years of rugged use, with fully coated optics of high quality. ► Eyepiece 10 x widefield and 15 x Hyg. 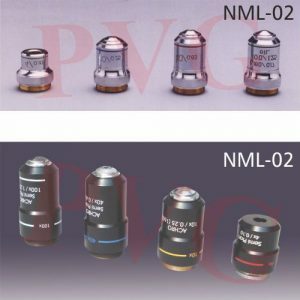 ► Quadruple revolving nose piece with 4 x, 10 x, 40 x S.L. and 100 x S.L. Oil immersion objectives. ► Focussing by separate coarse and highly sensitive graduated fine focussing knobs. ► Fixed mechanical stage size 120 x 120 mm for X & Y movement of side upto 50 x 75 mm with graduated scale and vernier. ► Substage condenser N.A.1.3 moving up and down through rack and pinion. ► Illumination by a plano-concave mirror which can be replaced by substage lamp working on 6 V 20 W, 220 V 50 Hz. ► Magnification 40 to 1500 x. ► Horse shoe shaped, hinged stable base. 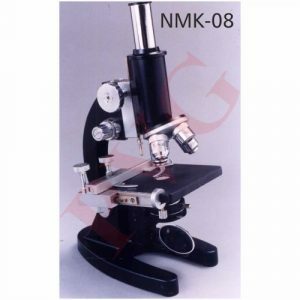 ► With inclination joint to inclined microscope for easy viewing even when seated. ► With focus stop to prevent slide damage. ► Supplied complete with a cleaning cloth, dust cover in a wooden storage cabinet having lock and key facility. Advance Design and Special Features, Backed by Swift Quality and Reliability. Body: All aluminum pressure diecasted body with P.U. Coating in light cream shade. Observation head: 360° rotatable and 45° inclined, binocular head with all anti-fungus coated prisms. Eyepiece: A paired 10X wide field eyepiece. Nose piece: Quadruple ball bearing nosepiece. Focusing system: Co-axial focusing system with three planetary gears assembly. Mechanical stage: Coaxial Ball bearing double-plate mechanical stage for smooth functioning. Condenser: Bright field sub stage condenser having 1.2 N.A. Achromatic, parfocal, interchangeable. Type Mag. N.A.